One of the things that makes medical malpractice cases different than other types of personal injury cases is the level of injuries involved. Medical malpractice can and frequently does result in very traumatic, life-changing types of injuries and sometimes even death. One of the worst types of physical injuries a person can suffer as a result of medical malpractice is an amputation of the leg. 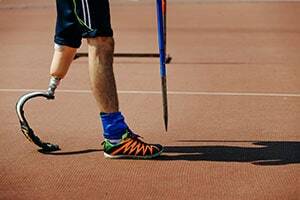 Losing a leg can literally destroy a person's quality of life in a number of ways, starting with leaving them unable to walk independently. This page will look at types of medical malpractice that can result in leg amputation and the typical settlement value of those cases. There are really only 2 potential reasons why it might become medically necessary to amputate a person's leg. The first reason for an amputation is if the leg is crushed or so badly damaged in an accident that it cannot be medically repaired. The second medical situation that might require amputation would be an infection or other event that causes extreme necrosis in the leg that cannot be reversed. When a leg amputation is caused by some sort of medical negligence it always involves the second situation where amputation is necessitated by infection or some other medical condition that causes the cells in the leg to decay and die beyond the point of regeneration. Only certain types of medical mistakes in certain treatment settings have the potential to cause leg amputation. There are 2 primary categories of medical errors/negligence that account for over 90% of all malpractice cases resulting in leg amputations: (1) surgical errors; and (2) failure to diagnose. This category of malpractice includes more than just botched surgeries or mistakes by the surgeon during a procedure. Surgical error refers to any sort of negligent medical care related to a surgical procedure and the post-operative recovery and treatment. Most cases involving leg amputations actually involve treatment errors in the post-surgery recovery phase. One common example of this is failing to properly monitor, diagnose and manage post-operative infections or other complications arising after the surgical procedure is performed. Post-operative complications are not limited to infection and can include blood clots or conditions which disrupt blood circulation to the legs. The most common type of medical malpractice associated with leg amputations involves failure to diagnose. Diagnostic errors occur whenever doctors negligently fail to diagnose, take too long to diagnose, or misdiagnose a medical condition. The key here is that the misdiagnosis or delay in diagnosis must be negligent, which basically means that a reasonable doctor would have made the correct diagnosis under the same circumstances. When a negligent delay in diagnosis leads to leg amputation the misdiagnosis almost always occurs in the hospital emergency room setting. The classic example is where a person comes to the emergency room with generic symptoms and doctors diagnose them with something simple only to find out they had a blood clot or some serious circulatory condition. Summarized below are recent verdicts and reported settlements from actual medical malpractice cases in which leg amputation was involved. These cases are provided for informational purposes only. Menapace v Mem. Hosp. of Sweetwater (Wyoming 2018) $10.1 million: man goes to hospital emergency room with severe leg pain and is diagnosed with diabetes and peripheral vascular disease and sent home. Just 4 days later he is rushed back to a different hospital where this time he is diagnosed with acute limb ischemia, sepsis and renal failure requiring emergency amputation of both of his legs. He sues the first hospital for failing to timely diagnose and treat the vascular condition that later led to the amputation of his legs. The jury found the hospital and its doctor 90% at fault and awarded $10,165,000 million in damages. Sfameni v Ryan (Rhode Island 2018) $62 million: 55 year-old man goes to hospital for back pain and sudden weight loss. He has been on blood thinner medications for years for treatment of a genetic blood clotting condition. Doctors at the hospital send him home but instruct him to stop taking his blood thinners in preparation for further testing. After being off the blood thinners for 17 days he develops substantial blood clotting in his legs and lungs. The clotting causes gangrene in his right leg requiring immediate amputation. He brings a malpractice suit against the doctors for negligently taking him off his blood thinners and after an 8 day trial in Providence a jury awards him $62 million in damages. Gartrell v Aiken Regional Med. (South Carolina 2018) $13.2 million: woman in her mid 50s goes to the hospital with difficult breathing and other symptoms. Doctors take chest x-rays and initially diagnose her with pneumonia. After suffering cardiac arrest she is transferred to another hospital where doctors diagnose her with sepsis (a dangerous infection of the blood). Both her legs are amputated above the knees. She sues the first hospital and its doctors for failing to timely diagnose her sepsis, which would have prevented the amputations. After a week long trial the jury takes only 2 hours to award plaintiff damages of $13,750,000 consisting of $10,000,000 in non-economic damages and $3,750,000 in economic damages. Glasgow v Brassubaman (Pennsylvania 2016) $4.2 million: man in his 70s undergoes bilateral knee replacement surgery at Temple University Hospital. The surgery is successful but during his post-operative recovery he develops pressure sores on his legs which eventually lead to a serious infection leading to emergency amputation of his left leg above the knee. He sues the hospital for negligent post-operative care. A jury in Philadelphia awards damages totaling $4.2 million. Tolson v St Agnes Hosp (Maryland 2014) $5.2 million: plaintiff goes to the hospital after getting his leg stuck in an automatic gate. Emergency room doctors diagnose him with a sprained knee and send him home. He returns to the hospital 2 days later with no feeling in his leg at which point doctors realize the injury actually torn all of the ligaments in his knee so badly that his popliteal artery was damaged. The artery damage restricted blood flow to his leg and the tissue in his leg is mostly dead requiring emergency amputation. After a 2 week-long trial in Baltimore City the jury awards him over $5 million in damages. Miller & Zois has a team of highly effective medical malpractice lawyers. We have a long track record of delivering meaningful results to the victims of poor medical treatment. A few years ago, a jury awarded our client $5.5 million in an amputation malpractice case. If you have a case involving an amputation resulting from medical malpractice call us today at 800-553-8082 or get a free online consultation.